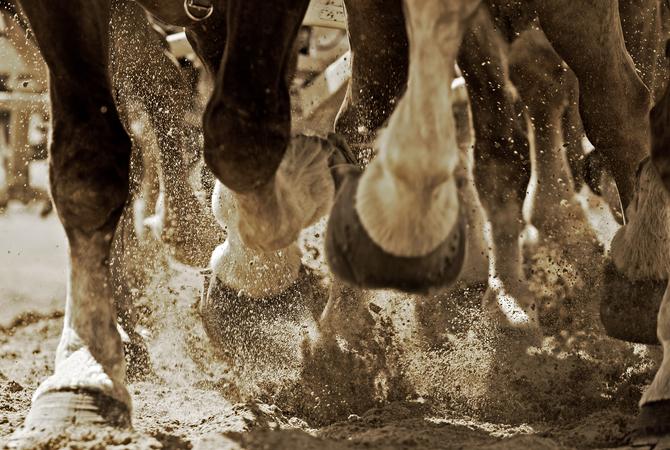 Pros and Cons: Are Horse Shoes Necessary for Hoof Health? Would these hooves be better off with shoes? The controversy of whether horses need shoes to maintain hoof health is as old as the development of the first "horse shoe." On the one hand we have the barefoot-favoring horse professional or owner; in the middle we have the consider-all-the-options people, and on the other hand, we have the horse professionals and owners who believe that every domesticated horse needs to be shoed at least part of the time. Some horse professionals and owners think of horseshoes as a necessary evil brought on by circumstances that limit the horse's natural exercise and other factors involved in the domestication of horses; others disagree, some vehemently. It is true that any horse's overall strength, respiratory, circulatory and immune system will benefit from the hoof care that takes into account each individual horse's health, conformation, work load, stabling and living situation and age. A poorly functioning hoof can bring down the entire system, while alternatively, a properly functioning hoof has the effect of nourishing and revitalizing the whole horse. Some horse professionals and owners think of horseshoes as a necessary evil brought on by circumstances that limit the availability of the horse's natural exercise, stabling conditions, and other factors involved in the domestication of horses. Others question this basic belief. In 1897, four bronze horseshoes with what are apparently nail holes were found in an Etruscan tomb dated around 400 B.C. Around 1000 AD, cast bronze horseshoes with nail holes had became common in Europe. Farriers are trained in veterinary medicine relating to the foot and lower leg of a horse and recognize that a hoof that has not been trimmed properly can curl back on itself, which results in problems in the rest of the horse's body. The 13th and 14th centuries brought the widespread manufacturing of iron horseshoes. 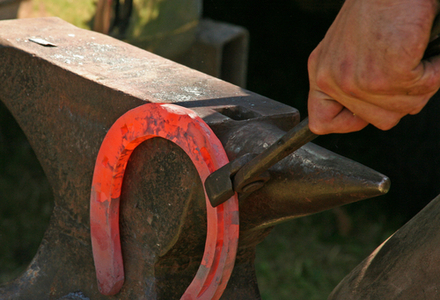 Hot-shoeing, the process of heating the horseshoe before shoeing the horse, became common in the 16th century. Before the first horseshoe was ever patented, concerned horse owners and professionals were attempting to discern what worked best for horses. This caused alarm for some horse professionals who saw the development of shoeing horses with metal shoes and piercing nails as causing harm to the horse's feet. They saw the shoes not only as uncomfortable for the horse, but as actually damaging to hoof structure and the circulation of nourishing blood within the foot with metal shoes leading to interference with the finely tuned mechanisms within the hoof. According to research and experience by both horse professionals and owners: If a horse has good hoof and leg conformation; if the horse forages for most of its feed; if the horse has a limited the workload, and hoofs are trimmed to avoid excess or abnormal hoof wear and injury to the foot, a horse may live and work safely without shoes. A competent farrier can help determine if a horse will be better off going barefoot. In fact, some farriers prefer letting horses go barefoot for at least part of the year. If going unshod is a healthy option for a particular horse, and if the horse's activities and workload allow maintenance of healthy hooves and joints without shoes, this is a viable option. For horse owners who want to let their horses go barefoot, it is important that they recognize most horses may not be able to walk comfortably especially on rough or rocky ground immediately after shoe removal. Most hoofs become degenerated to some degree from wearing shoes that are nailed on and the soles often become thin, so the horse's feet need some time to heal and adjust and grow a strong protective sole callous. For mares and foals, this can take between a few weeks and several months, depending on the individual horse. Meanwhile, it is important for the horse to be comfortable, but kept active with normal exercise routines and work load. For horses that have tender feet, hoof boots will help keep the horse comfortable and will help prevent damage to tender hoofs. Remember when a horse goes barefoot, the horse's feet need to be checked and the hoofs trimmed approximately every six weeks to keep them even and to prevent breakage. 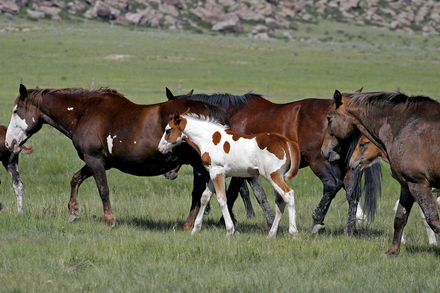 Normal activities of wild horses wear hoofs to a smooth, even, hard state with a thick sole. Wild horses walked and grazed continuously over a wide range of terrain that had never been plowed or paved. Their hoofs were worn to a smooth, even, hard state and the continual stimulation of the sole of the foot caused it to become thick. Domesticated horses usually do not graze over any distance to forage for feed. They live on irrigated land, arena footing, and stall bedding, walk on asphalt or concrete roadways, and have lost some of their original strength and conformation through breeding. Horses that are kept in stalls or small turn-out areas are constantly exposed to urine, which contains ammonia. The hoof wall, which is composed mostly of keratin, is weakened by this exposure. Although shoes do not prevent damage from ammonia exposure, they reduce wear on weakened hoofs. Through breeding, many domestic horses have bone or musculature problems in their legs that are helped dramatically by corrective or therapeutic shoeing. Many horses race or participate in show and competition events. The training involved and the events themselves create stress in the hooves, legs, and joints because of concussive force. Properly designed shoes help alleviate the stress and protect the legs and hoofs. Talk to your veterinarian and farrier. They will be able to address the important factors and circumstances of your particular horse and help you make a decision that will be best for you and your horse. Please help us keep EquiMed active. Any purchases that you make through our site provide us with a small commission at no cost to you. Please begin your horse health shopping here . An essential illustrated horse ownerÂ¹s guide to soundness, hoof care, and shoeing Maximum Hoof Power: A Horseowner's Guide to Shoeing and Soundness is a comprehensive guide to help horse owners develop proper hoof-care practices and to gain an understanding of shoeing techniques. It details both the reasons for shoeing horses when necessary and when it contributes to horse health to let horses go barefoot. Designed to protect horse's hoofs, this Davis Barrier Boot made of rubber, gives the hoof plenty of protection while on the pasture or out riding. Also great for covering the hoof when meds are needed. Very tough and rugged. Formulated for maximum hoof health Farnam Hoof Supplement contains the essential amino acids lysine and methionine vital for growth and tissue maintenance to support healthy hooves. Also contains vitamin B-6 to aid in the metabolism of these amino acids and 20 mg of biotin/oz.